Committee members discuss the police complaint process at a meeting. The committee will release a survey to garner public opinion about the process. The Citizen Police Complaint Assessment Committee announced its plans to distribute a public survey reviewing the current police complaint process at a Wednesday meeting. The committee, which held its first meeting in October, is in the beginning stages of reviewing the current citizen complaint review process, said committee member Karen Courtright. It will then provide recommendations to the Human Services Committee by May. 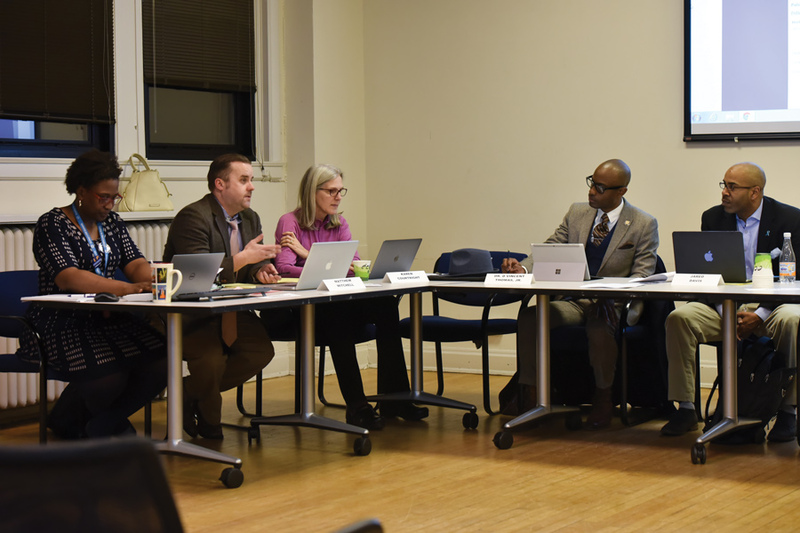 The first priority of the committee — which is comprised of nine members appointed by Mayor Steve Hagerty and functions independently of Evanston Police Department — is to investigate the decline in complaints filed over the past few years. Only 17 formal complaints were filed in 2016. Courtright said the survey will help illuminate reasons for this decrease. The current process in Evanston begins with an investigation conducted by EPD. The findings of the investigation are then presented at Citizen Police Advisory Committee and Human Services Committee meetings. The two committees then vote to determine if formal or informal action should be taken against an officer. Complainants file the form directly to EPD. Committee members said they were interested in implementing a process that includes a third-party mediation between the complainant and EPD. The committee is also looking to the complaint practices of other comparable cities across the country that it could recommend to the Human Services Committee. In a review of oversight models, for instance, the Police Assessment Resource Center outlines the complaint processes of thirty U.S. cities. The processes are categorized into three models that attempt to separate internal police investigations from the complaint filing process: by entirely removing the investigatory power from the police department, by creating a shared investigation with Internal Affairs or by continuing an investigation through Internal Affairs under the supervision of a lawyer. Committee member Peter Demuth said that for Evanston, a college town with a diverse population, it may be best to implement a combination of other cities’ models. Mitchell said he plans to meet with Hagerty and Evanston Police Chief Richard Eddington to discuss the committee’s progress before its next meeting.